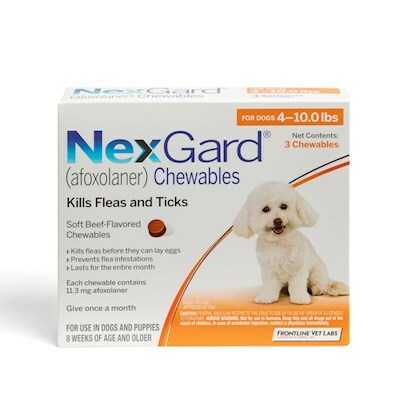 Meet Nexgard - the new chewable flea and tick preventative made by the same people that brought you Frontline Plus, so you know it's quality. Rated 4.5 out of 5 by 81 reviewers. Nexgard - Dog loves it! Best Value for the BEST flea medication! Advantix stopped working and this worked like a charm, no side effects! This is so much easier and effective than the topical. Good product, my dog loves them. Hard to keep up with what you ordered when they come from different places. Lots better than Frontline. Got fleas on Frontline and my vet stopped selling it so used Nexguard and fleas disappeared. This product keeps fleas away! Great product without the mess. Pricey, but totally worth it. Nexgard Has Kept Fleas and Ticks OFF of Our Dogs! Nexgard works well to keep ticks off. We don't have fleas but live in the woods where ticks are plentiful.